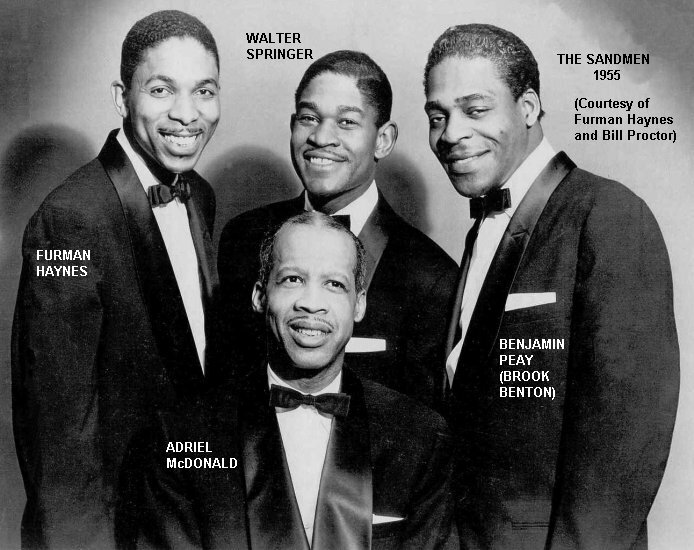 Adriel McDonald had been the last bass of the Decca Ink Spots. In late 1953, he found himself out of a job, when the group quit lead singer Bill Kenny (who was using them less and less by that time). However, Adriel liked being part of a group and started searching around for some new singers. He wasted no time in recruiting some former gospel singers who'd decided to switch to secular music: Walter Springer (second tenor), Furman Haynes (baritone; he'd been in the 4 Deep Tones), and Benjamin Peay (lead; he was Springer's brother-in-law). Ah, Benjamin Peay. 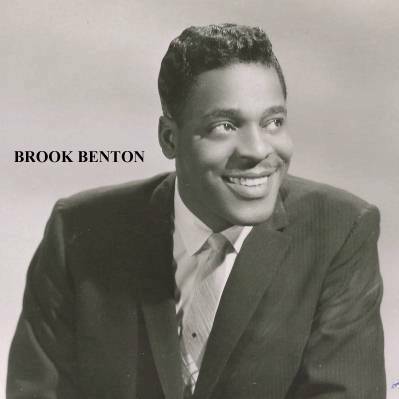 Just to cut to the chase at the beginning, he would later change his name to "Brook Benton." (When asked, he said that his name was supposed to be pronounced "P. A.," but since no one ever got it right, he took to pronouncing it "pea" himself.) He was born Benjamin Franklin Peay in Camden, South Carolina, on September 19, 1931, the son of the choir director of the Camden Jubilee Singers. This ensured that young Benjamin would be trained in gospel music. During this period, Benny met and formed a friendship with DJ Bill Cook (manager of Roy Hamilton). Also, since the Ink Spots had been managed by the Gale Agency, this is where Adriel took the Sandmen. While there, they met Roy Hamilton (who was also represented by Gale). All of this came together, and Bill Cook brought them to Columbia's Epic subsidiary, home of Roy Hamilton. This is what Bill Cook had to say about Benny Peay: "In the music business, I've had the honor to work with, and for, many of the great names in entertainment. Roy [Hamilton], of course, was the one I believed in and worked hardest for... but when I first heard [Peay], I knew he had the talent it takes to be a truly sensational star." Cook was an odd bird in the music industry: he seemed to take a genuine interest in the artists and was always fair in his dealings with them. 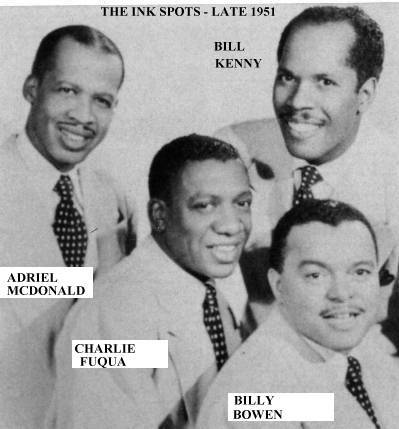 When it came time to issue some sides, Columbia opted to place them on its Okeh subsidiary rather than on Epic (meaning that they regarded them as pure R&B, with little chance to hit the Pop charts). "When I Grow Too Old To Dream" and "Somebody To Love" were released in February 1955, and reviewed (both "good") on February 19. 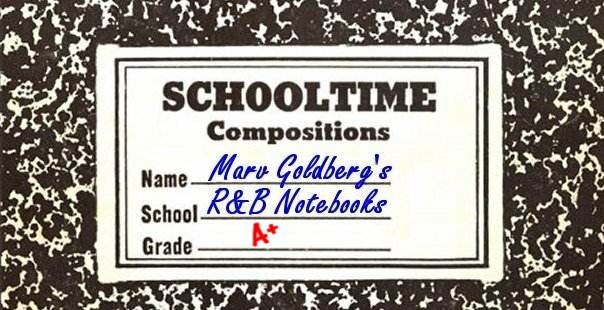 Other reviews that week went to Chuck Willis' "Lawdy Miss Mary," the Robins' "Whadaya Want," Linda Hayes & Platters' "Oochi Pachi," Arthur Lee Maye & Crowns' "Oochie Pachie," the Feathers' "I Need A Girl," Bobby Relf & Laurels' "Farewell," Johnny Fuller's "Johnny Ace's Last Letter," and the Street Singers' "Caldonia's Mambo." With a record out, they got a few appearances in New Jersey (home of Bill Cook) and Pennsylvania; a grand total of three. A planned tour, as backup group to Savannah Churchill, fell through. By that time, the Sandmen had been back to the studio. On February 4, they'd been brought in to provide backup for songwriter/singer Lincoln Chase [future writer of "Jim Dandy"] on "That's All I Need," "I'm Sure," "The Message," and "Things Money Can't Buy." "That's All I Need" and "The Message" were released on the prestigious Columbia label in April. On April 21, they backed up another singer/songwriter, Chuck Willis, on "I Can Tell" (they weren't on the flip, "One More Break"). These tunes were issued in May and both were rated "good" on May 28, along with Varetta Dillard's "Promise Mr. Thomas," the Solitaires' "My Dear," the Varieteers' "Call My Gal, Miss Jones," the Rhythm Aces' "Whisper To Me," and the Starlings' "A-loo, A-loo." Okeh then arranged another session for the Sandmen, but it wasn't to be what the group had expected. Since Benny proved to have a marvelously expressive baritone/bass lead voice, which stood out in an era of tenor leads, management was more interested in having him as a soloist. The session took place on May 26, and the group recorded three more songs: "Ooh," "I Was Fool Enough To Love You," and "Bring Me Love." A week later, on June 2, without telling the rest of the group, Benny laid down a solo track, "The Kentuckian Song," the theme from the Burt Lancaster movie of the same name. And then the magic started. 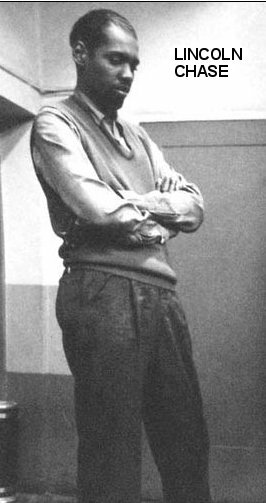 When "The Kentuckian Song" and "Ooh" were released in June, the label credit went to "Brook Benton" (with the Sandmen also credited on "Ooh"). [Benny Peay's new name seems to have come from Okeh A&R man Marv Halsman.] The June 25 issue of Billboard announced that Epic had signed Brook Benton (sometimes spelled "Henton"), "one of the original Sandmen" to record Pop and R&B solos for its Okeh subsidiary. The story should have had a happy ending for Brook Benton, but that would have to wait a while. As a soloist on Okeh and Epic, he was a flop. He switched over to RCA's Vik subsidiary in 1957, but, in spite of getting to sing "If I Only Had Known" in that year's Alan Freed epic, Mr. Rock & Roll, he had only a single chart appearance (1958's "A Million Miles From Nowhere," which peaked at #82). Fortunately, Brook had more than his singing talent to fall back on: he was also an accomplished songwriter. Probably his two biggest in that department were Clyde McPhatter's "A Lover's Question" and Nat "King" Cole's "Looking Back." Finally, in 1958, he switched labels once again; this time to Mercury, and this time it worked. In early 1959 he had his first smash hit with "It's Just A Matter Of Time." This was followed by "Endlessly," "Thank You Pretty Baby," "So Many Ways," "Baby (You've Got What It Takes)," "A Rockin' Good Way" (both duets with Dinah Washington), "Kiddio," "The Boll Weevil Song," and "Hotel Happiness." His last major hit was 1970's "A Rainy Night In Georgia," recorded for the Cotillion label. Brook Benton passed away in April 1988. An interesting story that some long-forgotten singer told me: Benny Peay (back in his gospel days) was a heavy drinker. But he was one of those rare guys who sounded better the more he drank! The Sandmen hardly set the music world on fire. However, if you've never heard "Somebody To Love," do yourself a favor and hunt up a copy. It's a marvelous ballad that would have made the charts, if only Okeh had pushed it. Special thanks to Bill Proctor. Discography courtesy of Ferdie Gonzalez.